The year 1896 was “a very good year” for many reasons. It was in that year that Puccini’s Opera, La Bohème, premiered, gold was discovered in the Yukon, and the Dow Jones Industrial Average finished its first year at around 41. But perhaps closer to our subject, two other events stand out. Firstly, Henry Ford introduced the gasoline-fueled automobile to America and, secondly, Swedish scientist Svante Arrhenius suggested that a greenhouse-like warming of the planet could result from increasing atmospheric CO2. Thus, the possibility that the industrial revolution would ultimately become incompatible with the physical environment was first envisioned. Thus, global warming threatens to restore our planet to an ancient equilibrium – an equilibrium that was home to tropical plants and dinosaurs, but not to man. It is because of this integration with our economic system that the problem is so complex. And, in particular, because of the way our economic system incorporates so much of society, climate change issues are, indeed, issues for every man and woman on the planet. As the chemist Nathan Lewis has said: “The currency of the world is not the dollar, it’s the joule” (Lewis, Nathan S. (2007), “Powering the Planet”, Engineering and Science). Thus, the value in modern industrial processes is that they harness energy, focusing the transformational power of machines into production. Unfortunately, although there are numerous sources of energy which are not accompanied by the emission of greenhouse gases – solar and wind – the technology of transmission and storage of energy is still in its infancy. Image: “Mulan Wind Farm”, by Land Rover Our Planet. CC-BY-ND-2.0 via Flickr. Fossil fuels are simply one of the most efficient forms of stored energy. They are also a convenient form in which to transport energy to the places where it is needed. Fossil fuels are integrated not only into our economy, but into our society as well. The automobile, for example, is as much a cultural icon as it is a means of transportation. Thus, the economic consequences of energy production, use, storage, and transmission, as well as any attempts to control these processes, will reflect in the political arena, in daily life, on Wall Street, and on the global economy through a plethora of intricate, often interlocking, mechanisms. Western society has developed itself, largely oblivious to concerns of climatic change. The benefits in terms of quality of life are manifest, and they have become, arguably, the West’s primary export to the rest of the world. The, so-called, under-developed world has bought-in to the program and now seeks to align itself, economically, if not culturally, with the West. Yet, just as this dream begins to appear real, the limitations imposed by global warming are becoming apparent. Figure 1. 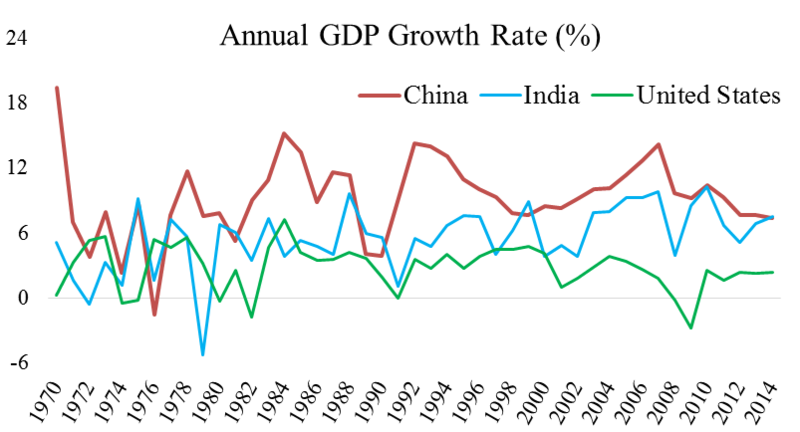 Image Credit: “Annual GDP Growth Rate for China, India and U.S.”, used with permission from the authors. Data Source: The World Bank; National Bureau of Statistics of China; Central Statistics Office of India; U.S. Bureau of Economic Analysis. China, in particular, and Asia, in general, has stepped up to the plate, as it were. GDP growth rates in Asia have been in the high single digits for decades, double or triple that found in the US. In Figure 1, we can see that China and India, representing a significant portion of the world’s population, are growing rapidly. Yet, this growth has come with an environmental cost. As outlined earlier, the expenditure of energy, largely derived from fossil fuels, is matching Asia’s economic growth. Figure 2 shows individual country’s CO2 emmissions as a percentage of global CO2 emmissions. Figure 2. 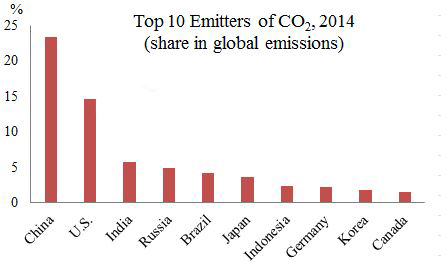 Image Credit: “Top Ten Emitters of Co2, 2014”, used with permission from the authors. Data © Statista 2015. Obviously, the West cannot simply say “slow down” to Asia. This is a non-starter. Yet, one cannot escape the facts. Global warming will, ultimately, through its devastating effects on global systems, destroy the very economic engine that fuels Asian (and Western) development. The challenge of Asia is to figure out how to maintain its development, while addressing the issues surrounding greenhouse emissions. This may not be as farfetched as it sounds. Most of Western development took place in a crude industrial environment. The internal combustion engine, for example, is largely a nineteenth century technology, although it was conceived of earlier. Yet, from modern computers to advanced materials, Asia today has the advantage of a century of innovation and technological progress. It need not wade through the swamp of carbureted engines and untreated exhausts that the West passed through. Nowadays, computer-controlled fuel injection is available and catalytic converters reduce noxious emissions. But there are also advances in solar panels and wind generation, computer control of electrical networks, etc. New “green” technologies are not only beneficial to the environment; they are also an important economic engine in and of themselves, providing entrepreneurial opportunity and jobs to those nations which adopt them. Asia is well-aware of this. China has been a “high speed” investor in clean energy since 2004. In fact, according to recent data from The Bloomberg New Energy Finance Report, China leads the world in renewable energy investment, spending a total of $89.5 billion on wind, solar, and other renewable projects in 2014 alone. Thus, rather than trying to contain Asian growth, sound market principles suggest that exactly the opposite strategy may encompass the best hope of finding a solution to the problem of global warming. Featured image: “#431 Global warming get warmer houses”, by Mikael Miettinen. CC-BY-2.0 via Flickr. Lucas Bernard, Ph.D., is a financial economist and professor of Business at The New York City College of Technology, The City University of New York. 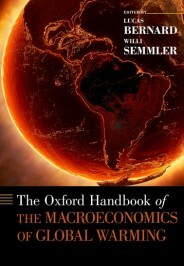 He is the co-editor of The Oxford Handbook of the Macroeconomics of Global Warming (OUP, 2014). Unurjargal Nyambuu, Ph.D., is a macroeconomist and research fellow in the Finance and Risk Engineering Department of New York University’s School of Engineering. Previously, Dr. Nyambuu served as an economist with the Central Bank of Mongolia, where she worked with International Monetary Fund (IMF) and World Bank (WB) colleagues on the effects of macroeconomic policy on local economies. She is also a consultant for the International Labour Organization, a United Nations affiliate based in Genève, Switzerland, where she studies the economic impact of “green” policy.